Communication with the Russian-built EgyptSat-2 satellite was lost in April of 2015 and now that nation's Rocket and Space Corporation (RSC) Energia is going to produce the EgyptSat-A satellite to replace the dysfunctional spacecraft, with a launch expected in 2019. 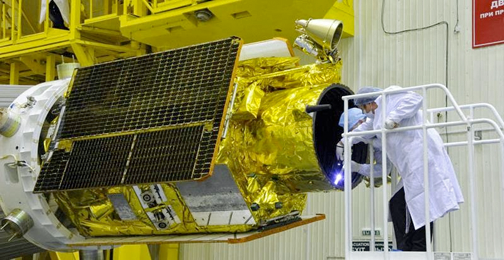 The EgyptSat-2 satellite during the build process, which is to be replaced by the EgyptSat-A satellite. The CEO of the company, Vladimir Solntsev, said as much to the Russian news agency, TASS. "We have already started producing the spacecraft," he said. RSC Energia stated the company had started producing EgyptSat-A via the lost satellite's insurance coverage, with the equivalent cost of this new work to amount to approximately $100 million. EgyptSat-A will be fitted with an advanced optical-electronic system as well as an onboard control package, a high-speed onboard radio link and improved solar batteries. The share of Russian components in EgyptSat-A will be much higher than in EgyptSat-2 and will include X-band transmitters.